I am glad that the mid-capacity segment is catching up in this country. This segment is apt for Indian riding conditions because there are a lot of current and upcoming motorcycles in this category that are affordable. Moreover, these motorcycles have just about enough power for mile-munching / track learning, and are easy on the pocket when it comes to maintenance as well. 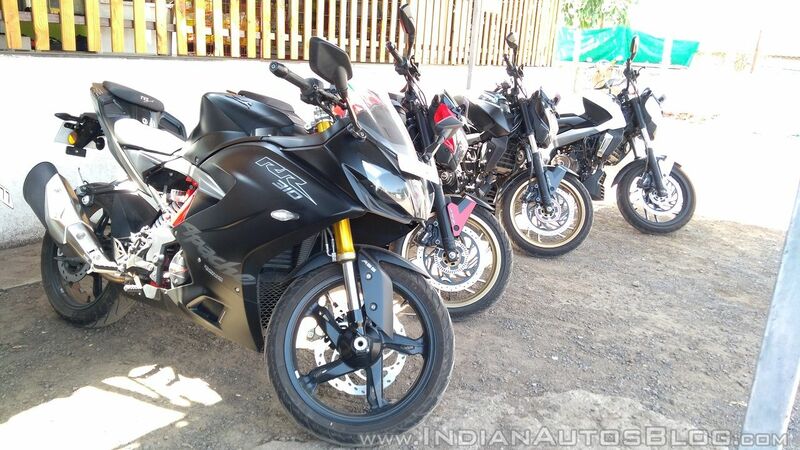 The TVS Apache RR 310 marks the Hosur-based manufacturer’s maiden attempt in this segment. Cleverly, they teamed up with BMW Motorrad to gain technical advantage, while implementing their own cost-effective manufacturing processes in the development of the motorcycle. The result is rather brilliant and extremely promising. The shark-inspired design is evident, as it is a production version of the Akula (meaning 'Shark' in Russian) which TVS showcased at the 2016 Auto Expo. It just took almost two years for the brand to give us the production version. TVS’ turnaround time is commendable, especially considering the RR 310 is its first flagship fully-faired product. The bike is an absolute looker, no less! I got the Racing Black colour variant, which looks relatively stealthy than the eye-ball grabbing Racing Red variant. However, this motorcycle also was the cynosure of all eyes- young and old, alike at traffic lights. The slightly tall windscreen flow nicely over the twin headlamps, and the fairing on the sides are gorgeously designed, while the red-painted frame peers through it. The high tail-section features a pincer-like tail lamp, and the meaty rear rubber complements the rear. The bi-LED projector lamps work really well at night. The spread is wide and long, and the high-beam illuminates directly ahead of you. TVS says the throw of the high-beam is more than 100 m, and I have no reason to doubt. The tail light and the indicators are also LED, which look sleek, all the while reducing power consumption. The claimed life of the headlamps are over 5,000 hours. Total fuel consumed (T Fuel), resettable. Auto Trip Meter (Trip A)- measures distance travelled in a particular day. When the date is changed and if the ignition turn-off time is greater than 6 hours, it resets automatically. Particularly useful to measure a day’s commute without fiddling with the trip meter 1 &2. High-speed indicator which records the top speed of the bike. Engine temperature, in degree Celsius. Overspeed indicator, which can be set from 30 to 195 kmph (yes), in increments of 5 kmph. When crossed, the gear-shift indicator lights up to warn the rider. It does not limit the speed of the bike, but just gives a warning. 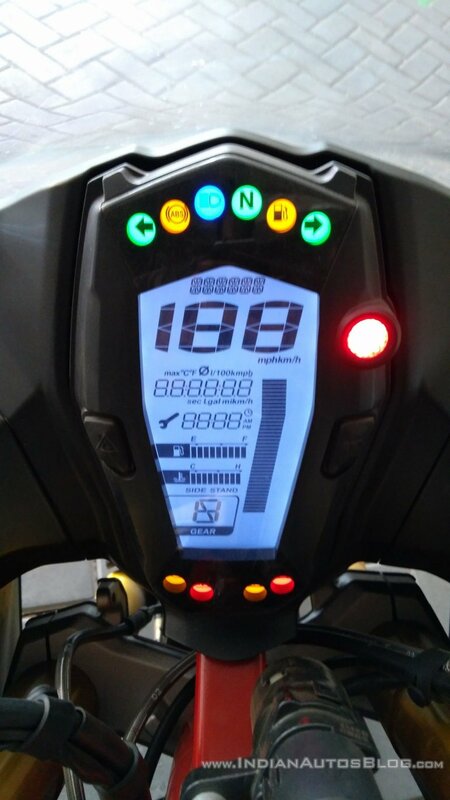 Trip timer, which displays the time taken to complete the trip until the ignition key is turned off and on. It’s resettable as well. Date with leap year calculation, and time (the time is displayed in all modes). Lap timer, which can record up to 9 laps. The pass-beam switch or short-pressing the Set button can start or stop the lap timer. Lap information (LP INF), which is used to view earlier recorded laps. Long press the Set button in this mode to view the last-achieved lap time. Short press the Set button to view other laps, and long press the button again to come out of this function. Setup mode, which is used to set the time and date. Apart from these features, there is a service indicator; 9-bar coolant temperature indicator; 9-bar fuel gauge. The fuel gauge lights up all the bars when the fuel level reaches 9 approximately litres; and 5 bars for approximately 5 litres. The low fuel light turns on when the fuel is less than 2.2 litres. There is a photo-sensor among the tell-tale lights, which automatically adjusts the brightness of the display as per the ambient light. I wish there was a ‘Back’ button because if you miss the required display mode, you’ll have to go through the rest of them all over again before coming back to the readout you prefer. A side stand indicator indicates whether the side stand is propped. Interesting thing about the side stand indicator is that it does not allow the bike to start when the bike is on side stand and in gear. However, the engine can be switched on while the side stand is down, if the gear is in neutral position. The switchgear reeks of good quality, and is comfortable to use with gloves as well. 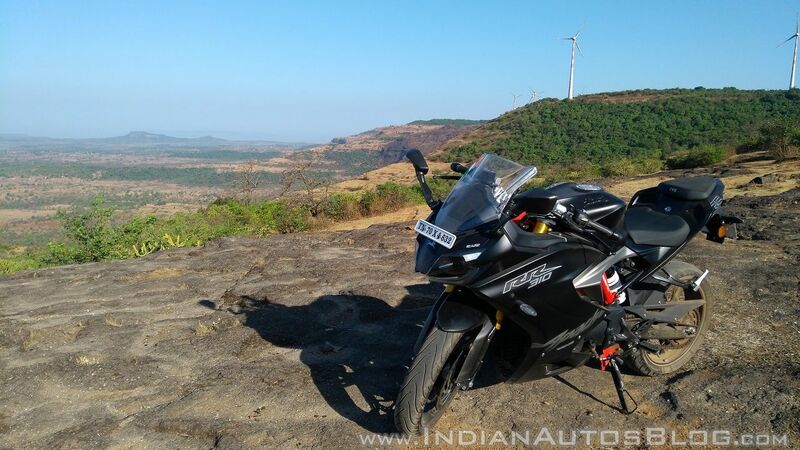 I took the TVS Apache RR 310 to some of the busiest parts of Pune on a hot afternoon. After riding, I can now confidently say the bike manages heat really well. The heat deflectors do their job effectively, and so do the radiator fans when things get too hot. The hottest engine temperature I reached was around 108 degrees Celsius, and the radiator coolant kept its cool, with 3 bars to spare out of 9. At times it gets mildly warm, but never uncomfortably hot. TVS recommends 50:50 ratio of Glycentine G48 and water, with a total quantity of 1 litre. The coolant reservoir is on the right side of the motorcycle, below the side panels. Overall, the thermal efficiency will not be a thing to worry at all. The clutch is a bit hard, and the sporty riding position will make the rider feel a bit uncomfortable in peak hour traffic. 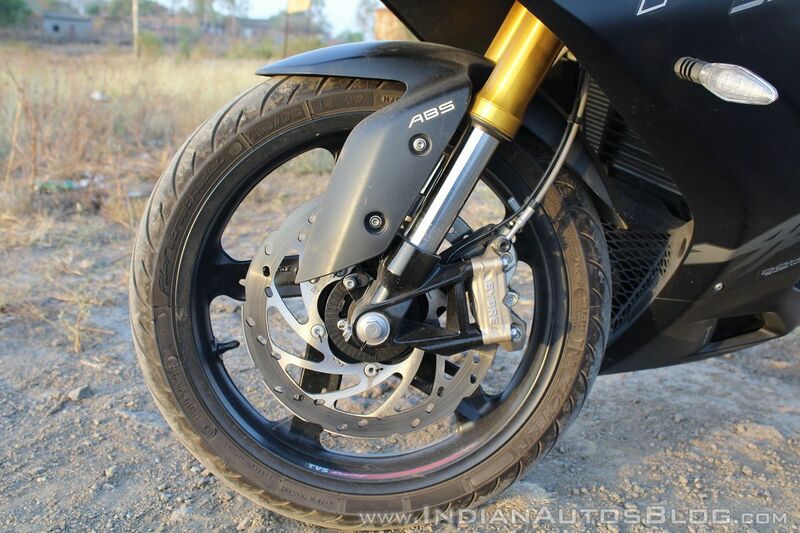 TVS has used negative back-rack gears for quick shifting and to avoid false neutrals. The gearbox works brilliantly with the cogs seamlessly shifting in rapid succession. There was not a single instance of false neutral either. Up until 4,000 rpm, the engine exhaust note is a tad ‘industrial’. However, post that, the exhaust note morphs into a bestial bark which provides pleasurable aural drama for a bike of this engine capacity. Long story short, the TVS Apache RR 310 indeed is. The engine offers satisfying bursts of acceleration in all gears. You can comfortably cruise at 120 kmph in sixth gear while the tacho hovers around 7,500 rpm. 100 kmph comes in at 6,000 rpm in top gear. The fourth gear is delightfully versatile, especially for ghat roads as it can propel the motorcycle between 35 kmph to 70 kmph comfortably. High-speed riding is a breeze, and if you are riding in a group of slightly more powerful motorcycles like the KTM 390 Duke, Bajaj Dominar 400, you can easily keep up with them on most (legal) occasions. Wind buffeting is kept in check, thanks to the large windshield and lowest drag coefficient in the 300 cc segment, at 0.26. The ergonomics is very comfortable for highway riding, with adequate room in the rider’s seat to move around. However, the high pillion seat is only good for short rides. I was able to touch a top speed of 168 kmph on a private road, which is more than enough for our roads. Coming to the numbers, it uses a 312.2 cc single cylinder reverse-inclined (for better mass centralization) engine with liquid cooling and fuel injection. The powerplant produces 34 PS at 9,700 rpm, and 27.3 Nm at 7,700 rpm. The engine braking is powerful, and a slipper clutch for the 6-speed transmission would have been helpful. When it comes to fuel efficiency, the motorcycle returned 35.13 km/l under a combination of brisk off-road riding mostly in second gear; and around 110 kmph high-speed touring on the highway (in sixth gear). The figure is pretty impressive considering the fact that it was ridden hard. The efficiency could easily cross 40 km/l if ridden with a sensitive wrist. Brownie points to TVS for making such a fuel-efficient performance machine. While everything is almost peachy about this motorcycle, let me address the elephant in the room: vibrations. The high-frequency vibrations are harsh, and start right from 4,000 rpm. The intensity of the vibrations stays the same at all speeds post that, despite the fact that the engine is counterbalanced. There is a lot of scope for improving the NVH levels. Also, there was an irritating buzz creeping from the instrument cluster after 4,000 rpm. It could be a fitting issue with this particular motorcycle. The trellis frame rides on 41 inverted cartridge telescopic fork at the front; and a rear pre-load adjustable KYB monoshock with Monotube floating piston technology. 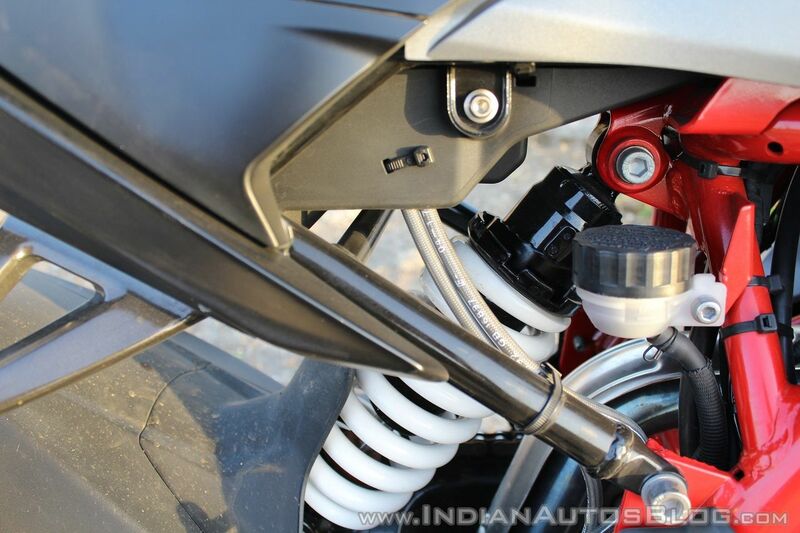 The suspension is slightly on the firmer side, but it helps in the dynamics of the motorcycle on the road. I even took the bike on remote trails, and it behaved commendably well, despite the fact that it is not designed for off-roading! The ample ground clearance of 180 mm really helps the motorcycle go over bad roads unscathed, and also inspires spirited cornering. 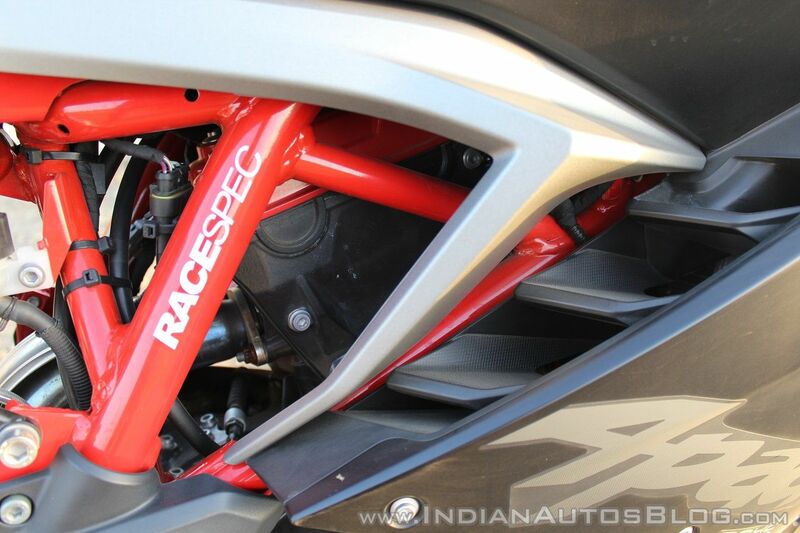 Compared to its rival, the KTM RC 390, the ground clearance is 1.5 mm more. If you are riding on roads that are consistently bad, you could decrease the spring preload for a suppler ride. There are ten notches on the shock absorber, and the default setting is on the third notch. Shifting to lower notches help in decreasing the spring preload and vice versa. You will need a ring spanner to adjust the preload. On normal roads, the TVS Apache RR 310 behaves predictably well, and the chassis is responsive too. 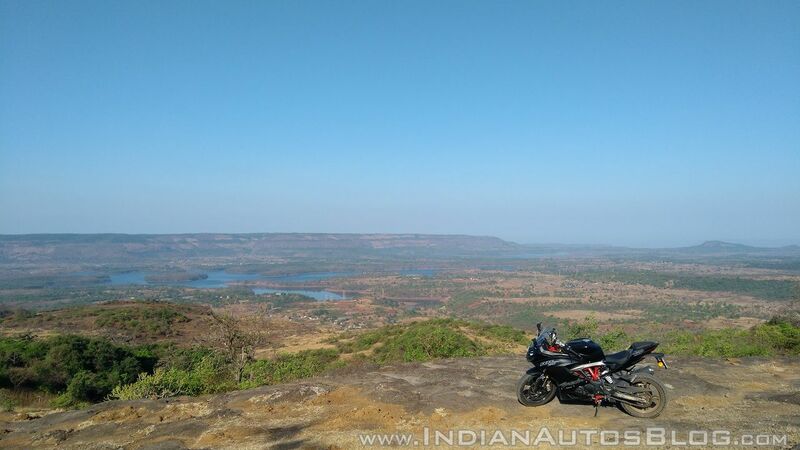 The bike is a joy to ride on the serpentine ghat roads of Maharashtra. There is commendable grip from the 110-section front and 150-section rear Michelin Pilot Street radial tyres. A large 300 mmm petal disc with radial Bybre calliper at the front and 240 mm rear petal disc with dual-channel ABS rein the motorcycle. Braking is simply brilliant, with plenty of bite, nice progression and feel. The saddle height of 810 mm takes some time getting used to; you’ll have to tip-toe a bit, especially if you are 5’5” or less. Compared to the RC 390, the seat height is 10 mm less. The rider’s footpeg feelers juts out, often getting caught in the pants while manoeuvring with feet. I’d recommend removing the footpeg feelers if you’re not using the bike to carve corners. TVS Motor Company has put their heart and soul on this product, and it is evident in its design and dynamics. 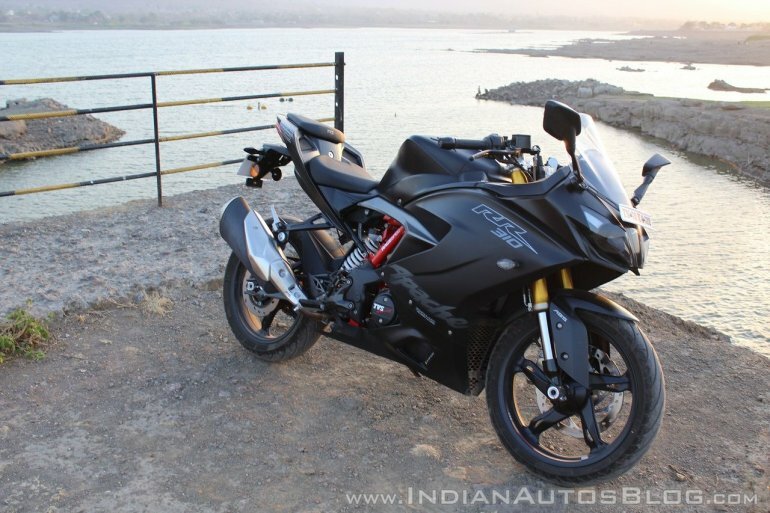 The TVS Apache RR 310 is a satisfying sporty tourer, agile track tamer, and also an obedient grocery-getter. 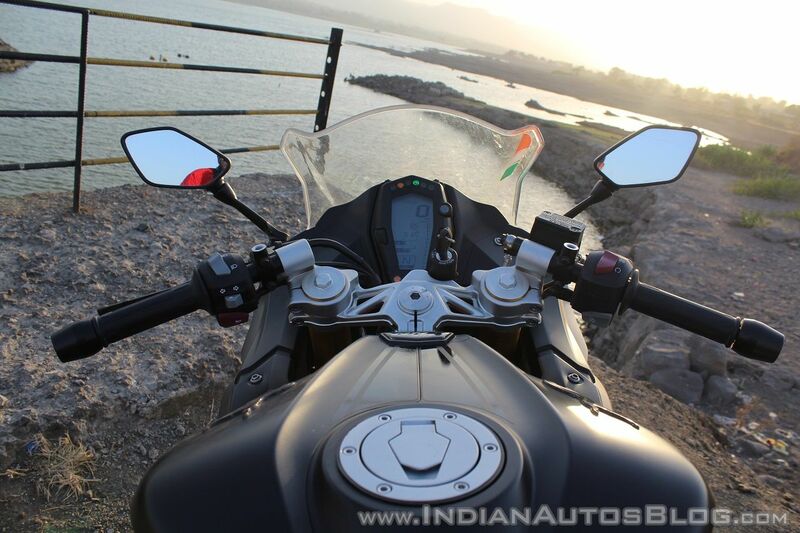 The TVS Apache RR 310 is almost a do-it-all kind of motorcycle, with looks that kill. At INR 2,23,000, ex-showroom, Delhi, it is one of the most affordable products in its segment. Coming to the service details, the first three services (1,000 km, 5,000 & 10,000 km) are free. The corresponding months are 2, 6 and 12 months respectively, (whichever is early). Fourth and fifth service come in at 15,000 km/ 18 months, and 20,000 km / 24 months respectively. Its competitor, the RC 390 is way too committed for everyday riding; and the Yamaha YZF-R3/ Benelli 302R are on the expensive side. 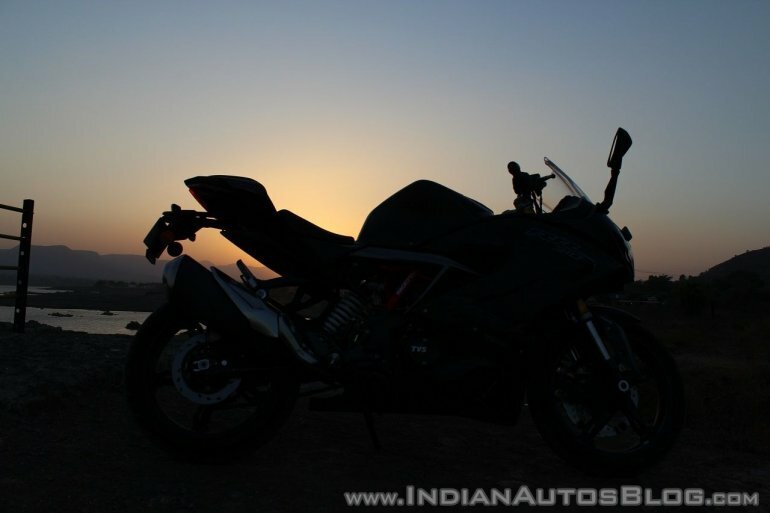 This leaves the TVS Apache RR 310 the sole choice if you want a value-for-money motorcycle with both beauty and brawn. The only chinks in its armour are the refinement, and the lack of a slipper clutch. Hopefully they rectify these in the next update which will make the already-promising motorcycle exemplary.